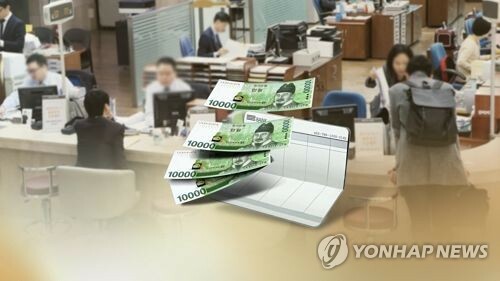 SEOUL, Oct. 23 (Yonhap) — Local banks profited 109 trillion won (US$96.28 billion) in interest income over a 3 1/2-year period ending in June this year as the spread widened, regulator’s records showed Tuesday. Data provided by the Financial Services Commission for a parliamentary audit showed an average 2.08 percentage points spread between interest rates of deposits and loans at 18 domestic banks in the first half of this year. The spread measured 1.97 percentage points in 2015, which narrowed to 1.95 percentage points in 2016 before widening to 2.03 percentage points last year. Citi Bank had the biggest gap over the measured period at 3.46 percentage point. Records showed 109 trillion-won profit from interest income from 2015 to June 2018. The total breaks down to roughly 29.1 trillion won in 2015, 30.1 trillion won in 2016, 32.5 trillion won in 2016 and 17.2 trillion won in the first half of the year.